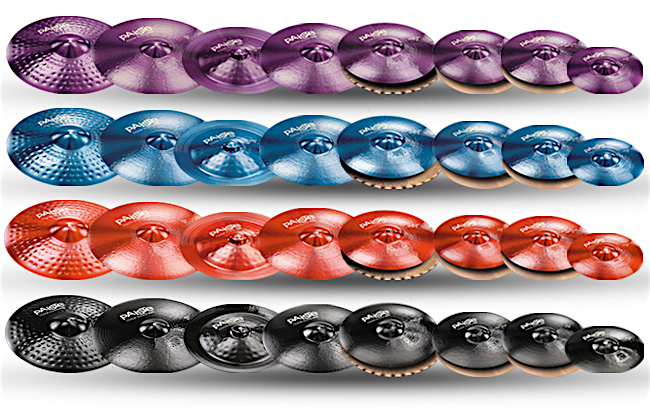 Coloured cymbals can be a bit polarizing – either people think they’re cool and love them or think they’re pointless and a gimmick. Me, I’ve always loved both the look and sound of coloured cymbals and have been a lifelong fan of the Paiste Color Sound and Visions lines. One of the first cymbals I ever bought in about 1988 was a Color Sound 5 red china, which I still have now. 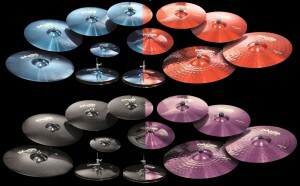 Since then, I have accumulated rather a lot of coloured cymbals in black, custom white and red. The 900 series is crafted from 2002 bronze. Most people are familiar with the 2002 line and an alloy that has been around for more than 45 years can’t be too wrong. The 900 line as a whole provides a full compliment of models and sounds including 10” and 12” splashes, three models of 14” hihat and a 15” heavy hihat as well, 16” to 20” crashes in regular and heavy models, five rides including 20” and 22” regular models, 20” and 22” heavy rides and the 24” mega ride and finally 14” to 18” chinas. 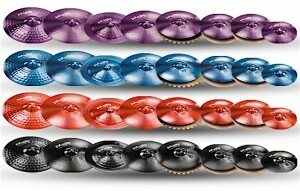 The 900 Color Sound cymbals – which are the focus of this review – come in four colours; red, blue, purple and black. I recently got to try a small selection of the Color Sound series. Featured in the video are some 14” hihats, 17” heavy crash, 19” and 20” crashes, 24” mega ride and an 18” china. I also tried the 14” sound edge hihats, 18” crash and a 22” heavy ride which weren’t in the video. The crashes to my ear are a little more in the upper mid to higher sonic range. There’s not a huge amount of low end or deep overtones. That’s not to say they’re overly top-ended, but they’re not thin cymbals and that translates to the sound you get. The crashes under 18” seemed to me to be more at the higher end of the scale. The 18, 19 and 20” models however give a more broad, deeper sound. However, all of them produce a clear and explosive sound and they cut through in a band context. The rides I tried were great. Admittedly, they were both thicker, heavier models but the sound they provided was powerful and clear both in terms of the bow and bell. Cutting is the word here. The china was trashy but not overly so. I found the attack to be clear and it didn’t have a huge amount of sustain. The hihats I tried sounded very bright and lively and felt quick to play. Neither of the two models were particularly thick as a pair but they felt good both under stick and via the pedal. Unfortunately, I can’t comment on the splashes as there weren’t any available for me to try. I have also had the chance to compare some 900 Color Sounds against my Color Sound 5 and Visions cymbals. From having both gigged and played in my studio with all three cymbal lines, I’ve found they work well together, and overall are quite complimentary of each other.